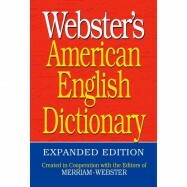 WELCOME TO THE WORLD OF WEBSTER'S! Federal Street Press is a division of Merriam-Webster, America’s oldest and most respected publisher of dictionaries and other language reference products. Our staff of full-time lexicographers is the largest in the country. This distinguished company represents a tradition that dates back to Noah Webster, author of the first dictionary of American English.